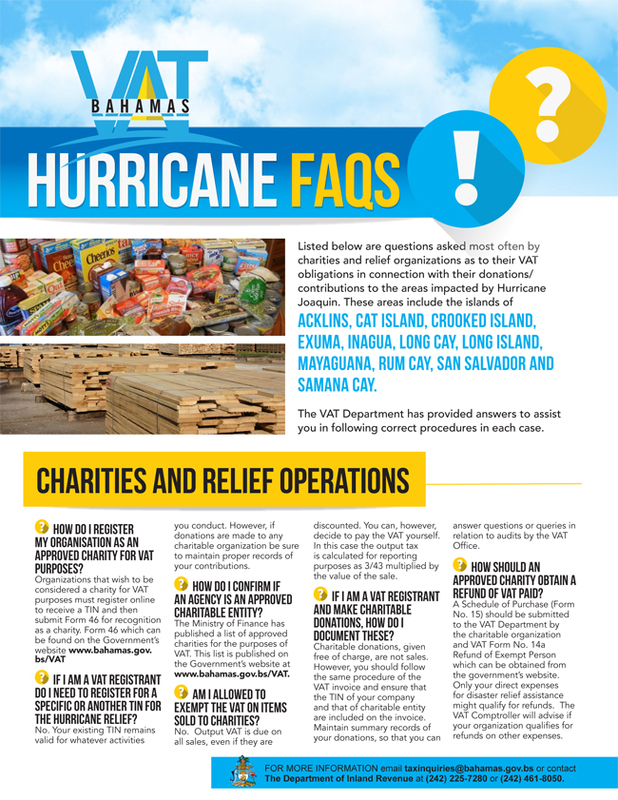 Nassau, Bahamas - The Department of Inland Revenue wishes to advise the public of several frequently asked questions which will be published which address Value Added Tax (VAT), islands that were directly impacted by Hurricane Joaquin and hurricane relief This only applies to those registrants in Cat Island, Mayaguana, Inagua, Exuma, Long Island, San Salvador, Rum Cay, Acklins, Crooked Island, Long Cay and Samana Cay. If you operate in one of the storm-affected areas the VAT Comptroller has extended your next return filing date by an extra month to November 30, 2015. This is for both quarterly and monthly returns that are due on October 28, 2015. You can contact the VAT Department to take advantage of this extension. The brochures can be accessed online through the government’s websitewww.bahamas.gov.bs/vat or you can pick them up in any of the local dailies beginning next week. For more information email taxinquiries@bahamas.gov.bs or contact The Department of Inland Revenue at (242) 225-7280 or (242) 461-8050.